Ever since I was first led into the desert to learn cholla harvesting decades ago now by my Tohono O’odham mentor and teacher, Juanita, I’ve looked forward to this signal and to our ritual, with hope for the return of desert-food-season, and with gladness —not to mention with a little trepidation for the hazards of the business. But in all the years of practicing our ritual harvest I’ve never seen the buds come on so early. 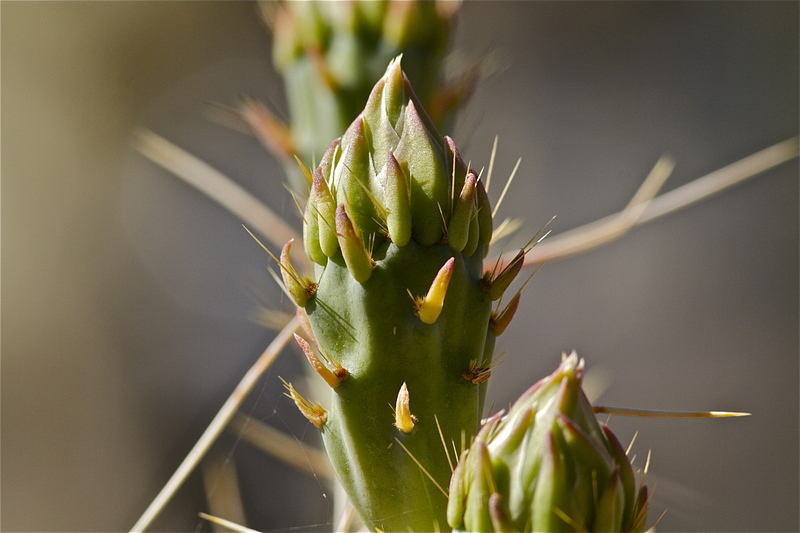 This is fully a month sooner than the “old normal.” All through the 1970s,’80s, into the ‘90s, we could predict the cholla harvest to be cranking up about mid-April and ending in the first week in May, a small window of opportunity. Curiously, the cholla season since the turn of the recent millennium has extended in both directions, beginning earlier and lasting longer into May. It is as if the chollas are hedging their bets, not knowing where climate change will lead….In spring of 2013 cholla flowers were open by April 2 and I picked my last bud on San Ysidro Day, May 15. And this year? Buds were showing before March and the first flowers were open on St. Patrick’s Day, March 17! These plants are sensing subtle climate signals to which we also should attune ourselves. While we have been basking in this desert’s “winter without a winter,” the chollas have been storing energy and the scant rainwater that fell, in prep for an early show. What this all means for its pollinators, for spiders, ants, packrats, birds—the whole food chain and web of life here in the Arizona Uplands of the Sonoran Desert—remains to be seen. So, time to grab your hat, collecting tongs, bucket (and don your non-floppy long sleeves, pants, tough boots) and head for the nearest cholla-covered hills for the harvest. As Juanita taught, begin your cholla harvesting expedition with respect and a touch of humility. This land can feed us from its prickly productivity if we shed the gimme-gimme attitude of contemporary culture and enter into it mindfully. All cacti are protected by law in Arizona. However, cactus buds or fruits, harvested with care and frugality, and with the landowner’s permission, is the only part of the cactus which is fair game. Our Native Plant Law is most enlightened and far-thinking. One might go so far as to call it sustainable. Imagine Arizona legislators realizing that our cacti and succulents are important to us! (That decision thankfully happened in an era of greater wisdom and compassion.) While cacti and other succulents appear so tough, and really can withstand extremes of heat and dryness, they are also vulnerable to many forms of human disturbance, to invasive grasses, fire, fungal attacks where tissue has been damaged, insect and rodent infestations. When native cacti or succulents are scraped from desert soil, we are left with aggressive, blah and boring, foreign grasses and weeds. The Sonoran Desert natives we know and love can’t easily re-vegetate. For best harvesting, Juanita would seek out stands of the gangly staghorn cholla (Cylindropuntia versicolor) growing plentifully over the foothills of the Tucson Mountains, Catalinas and Rincons. They are found on rocky upslopes down to lower rocky ground. Staghorn is the one with the sensational variety of colors—each plant a different brilliant phase of lemon yellows, oranges, rust, reds, wine, or maroon. While you are searching out unopened buds for collecting, give yourself a chance to savor the opened cholla flowers up close. Their petals appear to be made of shiny silk or satin with sparkling surfaces that leave you (and their insect pollinators) visually jazzed, maybe momentarily breathless with their beauty. You might see a tiny beetle or solitary bee bumbling about in a forest of stamens in search of the nectar the cactus pays them for their pollination services. We aren’t the only ones out harvesting. Juanita would jump at the chance to find a stand of pencil cholla (Cylindropuntia arbuscula, think arbusto in Spanish, referring to its shrub-like shape) because wee’pah-noy (as she called it in Tohono O’odham neok) has the largest bud and the fewest spines of all the chollas she sought, but it also is the most infrequently found. Pencil cholla tends to grow in a few clustered stands in flatter places, like the upper terrace of the Santa Cruz near Green Valley or lower bajadas in Avra Valley. 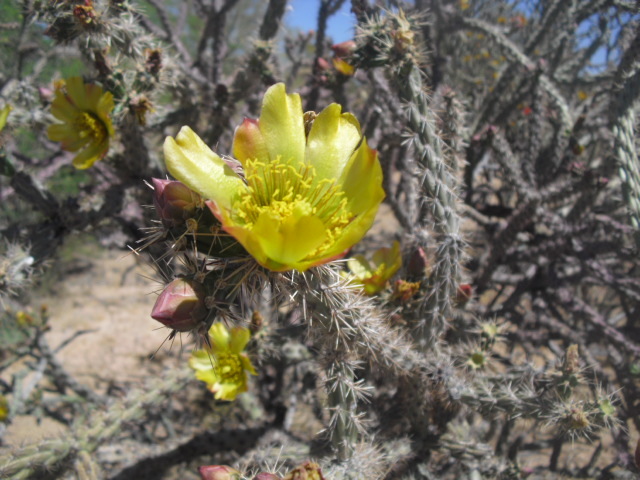 The buckhorn cholla (Cylindropuntia acanthacarpa meaning spiny-fruited), was Juanita’s least favorite because, despite its large delectable bud, the spines at every aereole on the buds are tough and difficult to remove, making preparation for eating a real ordeal. If left to mature into fruit, they still have a spiny cover. Another cholla found in higher desert into the grasslands, which Juanita occasionally collected, is cane cholla (Cylindropuntia spinosior)—the one with perky right-angle branches off a single trunk, which sag in winter frost-hardiness. They have recognizable round yellow fruits which may remain on the branch-tips all year. Their bud is a fat round, easily de-spined joy to harvest, and their open flower is a brilliant magenta. In a neat video by cinematographer Vanda Gerhardt (link on my website www.flordemayoarts.com), and in my recent Edible Baja Arizona article “A Budding Meal” (Vol. 5, pp122-24, www.ediblebajaarizona.com ), I have described how Juanita would initially brush off spines while on the plant, harvest one bud at a time always leaving some for other creatures and for the plants themselves, carry them back home in her bucket to de-spine fully in a wire mesh screen-box with an old broom. After a 15 or 20-minute boiling, she would discard the water, and voila, there were the delicious buds, tangy and tasty, ready to eat, or to stirfry with chiles and garlic, to pickle, or dry. Drying is an ordeal and takes a full week in dry weather to become stone-hard and safely storable, but it makes them available year round. If you have freezer space, freezing in its own juice is a perfect way to preserve them for the rest of the year’s enjoyment. When it comes to nutrition, cholla is up there with the super-foods, with highest measures of available calcium and complex carbs–plus flavor like a tangy artichoke. It can help strengthen bones, balance blood sugar, remove cholesterol, and provide sustained energy—wow what more do we need? Sautee mole powder in hot olive oil about 1 minute; quickly add minced garlic and stir-fry; slowly stir in 1 cup or more broth, extending it into a sauce of desired consistency as it re-thickens. 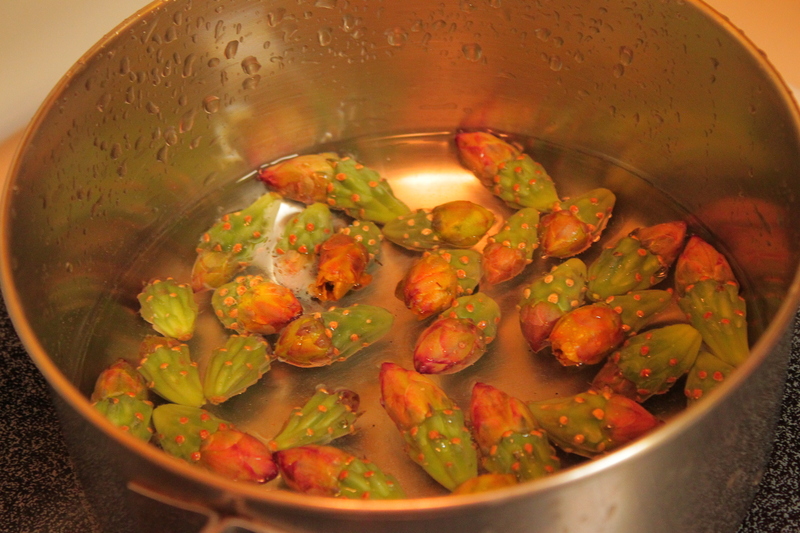 Add cooked cholla buds to the sauce. Serving suggestion: serve hot with corn tortillas and heirloom beans. Serves 4. If you want to try someone else’s harvest, try the Tohono O’odham Community Action’s (www.TOCAonline.org ) Desert Rain Café in Sells, Arizona, serving a mouthwatering cholla picadillo salad worth the trip out for lunch. 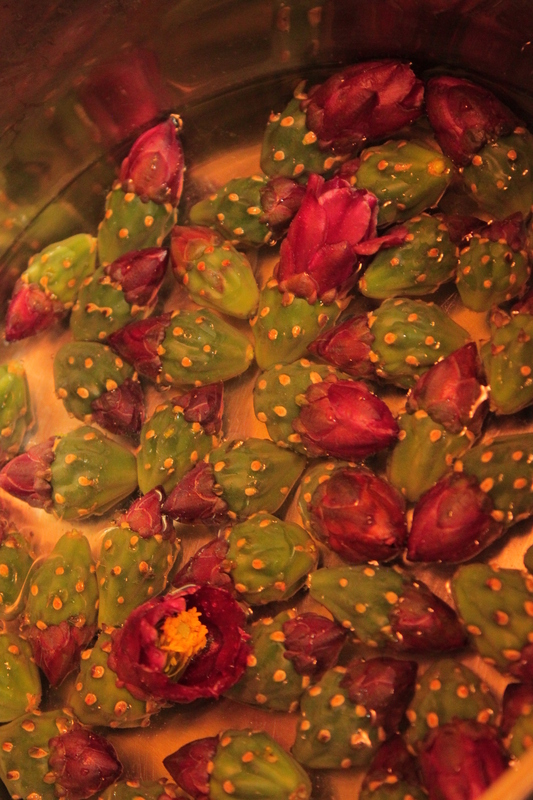 For more of my favorite ideas for fabulous cholla dishes and hors d’oeuvres, check out www.flordemayoarts.com. And for my detailed instructions on reconstituting dried cholla buds you can download from the same website. Dried cholla buds will be available for purchase from Native Seeds/SEARCH store (3061 N Campbell, Tucson) and web-store (www.nativeseeds.org) seasonally after April.